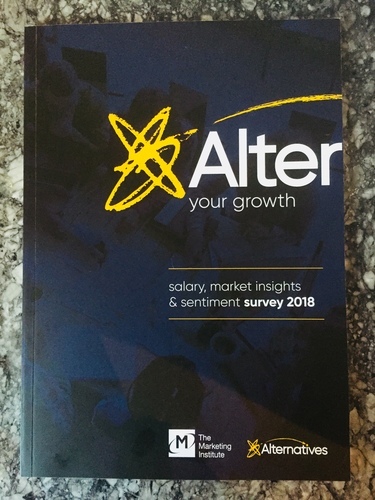 The 2018 Alternatives & Marketing Institute of Ireland Salary, Market Insights & Sentiment Survey is just out, which provides a unique insight into Ireland’s Marketing industry. Now in its fifth year and with almost 1,200 respondents from the marketing, digital and customer community, it takes an in-depth look at differences by company sector, size, career level, gender and other factors including Brexit and Marketing spend. In addition, 61% of respondents were awarded salary increases in the last year, 41% 1-5% increase. 2. On the gender front, male respondents in general are better paid, receive more non-salary benefits, feel more secure and are more engaged. Reflecting a similar result to last year, the survey finds that male respondents are paid more for the same roles than their female counterparts at almost all levels from practitioner level upwards. The pay differential increases the more senior the career stage. Eg a male director will get €15,000 more than a female director (+13%). A number of male respondents are less well paid at early career stage however. 3. Males get more benefits than women across almost all benefit categories in particular in areas such as bonuses, contributory pensions, healthcare, share options and cars. The exception is flexible working, which is also considered more motivating for women than men. 4. Market sentiment continues to be positive, but Brexit is looming and many sectors are anticipating its potential negative impact, in particular the government, logistics, pharma, motor and drinks sectors. 1 in 5 are still uncertain of how it will affect them. 5. The gig economy is alive and kicking in marketing. As the business that pioneered Flexible working in the marketing industry in Ireland since 2000, we’re pleased to report that its popularity has never dimmed. In the battle for talent, companies are increasingly accessing flexible resource as a way to attract or retain in-demand talent. 80% of companies access flexible resources (interim managers, contractors, consultants) and one in three respondents have contracted or freelanced before. 6. Resources are relatively tight with the majority of companies having marketing teams of 10 or less and budgets of €1m or less. Larger companies, multinationals and consumer facing businesses have greater resources. 7. Asked how Marketing and its role within an organisation is viewed, 64% of respondents said it was perceived as a strategic, revenue generating partner. 42% said it was perceived as strategic and crucially is also represented on the board. It’s also worth noting that 22% perceived it as a support function only unchanged from last year. In light of Brexit in particular, the marketing profession has never had a more crucial role to play in developing the economy, building new revenue streams and opening new markets. The strategic, customer oriented, value adding role it plays is critical. 8. Engagement is a big issue, at all levels (despite more people being secure in their roles), but particularly at more junior levels and amongst females. Despite security in their roles, salary increases and a positive outlook for their business in general, respondents are less engaged in their roles today and 61% expect to move on in the next two years. Although this is across the board, this is particularly marked for those at earlier career stages and for females. Would you like us to do a bespoke presentation for your company?